With landscapes that have remained largely undisturbed from their original states, Alaska is chock full of rare wildlife. There are the legendary grizzly bears, seas teeming with fish, and some of the most distinctive ungulates (that would be hoofed mammals) in the world. But beneath the surface of these world-famous species lie quirky facts and behaviors that add even more wealth to Alaska’s natural treasures. 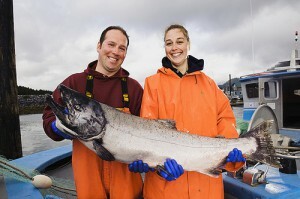 For foodies, fishermen, and those who get a little bit awestruck by enormous fish muscling their way upstream, the wild king salmon is synonymous with Alaska. Most associate a gorgeous deep pink with the delicious flesh of this 10 to 50 pound prize catch, but get this: there are actually “white” king salmon, too. While they are identical to other salmon from the outside, these fish look quite different when cut open. This is due to the fact that white salmon, unlike their fellow fish, lack the capacity to process the pigment of the food they eat. While once considered undesirable in the marketplace, white or ivory kings (approximately 1 in 20 king salmon) are now fetching higher prices than their more common brethren. Will your next catch be a lucky one? 2. The gender equal caribou. 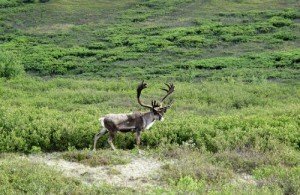 Unlike other members of the deer family, both caribou males and females sport antlers. Males tend to drop their antlers after the fall rutting season, whereas mature female caribou shed theirs in the springtime after giving birth. Other females ditch their antlers during the long icy winter. There’s nothing odder than coming across a field of abandoned antlers after a herd has vacated a landscape. 3. The bear with the white-tipped fur. 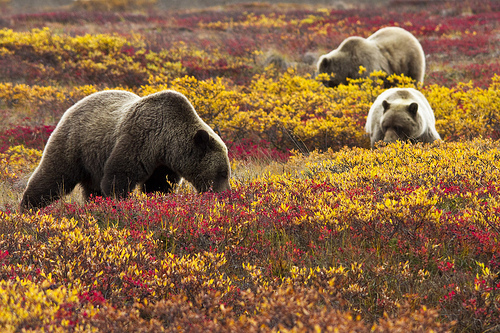 Alaska is bear country, with a robust population of black bears, grizzlies, Kodiak bears, and polar bears. Spotting one of these magnificent creatures is often the highlight of a hike in the woods. Just don’t creep too close for that perfect picture. Should you be lucky enough to view a grizzly bear on your voyage, keep these mind-boggling factoids in mind: There are over 30,000 grizzly bears in Alaska, which gives the largest state more grizzlies than the rest of the country combined. As the bears feast for winter hibernation, grizzlies can gain a whopping three pounds a day. It’s the anti-diet! A grizzly’s sense of smell is more sensitive than a bloodhound’s, which means they can get a whiff of a potential meal—and you—from miles away. With claws as long as human fingers, a grizzly’s paws command serious respect. Finally, the term “grizzly” was coined in response to the white tips on the hair of the bears’ back and shoulders. Don’t fear observing this great predator in the wild. Just be prepared. 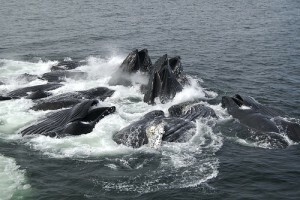 The waters of Alaska host resident and migrating whale populations, including humpback whales. Believe it or not, the humpbacks that feed in the frigid coastal waters of Alaska commence a 2,400 mile journey every fall to Hawaii. Once there, they mate, raise their young, and basically kick back for a tropical vacation before starting the whole migration over again. When wooing female whales, the male humpback whale sings a long ballad with many complex tones that can last up to 30 minutes! Earning a real A for effort, the males then learn an entirely new song during the mating season the following year. What can we say — it keeps things fresh. Alaskan huskies are the mainstay of Alaska’s world famous dog sledding teams, and have nurtured a mutually beneficial relationship with Alaskan peoples for centuries. A bit smaller than Siberian huskies, they can pull up to 75 pounds or more, depending on the terrain. Not too bad, considering that their own body weighs 75 pounds at most. At highest speed, a husky can run 20 mph, though when pulling a sled with a team, the average is often around 8 to 10 miles per hour. 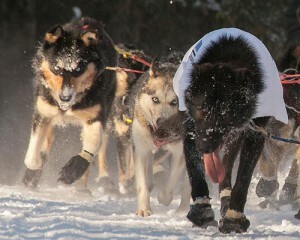 Most mushing teams are comprised of eight dogs, and once they’ve found their “locking stride,” they can run for miles upon miles. Alaskan huskies range in color, but one thing’s for sure: they all share a look of stone cold determination when it comes time to mush. 6. The Famous and Not-So-Famous Eagle. The United States’ signature bird is so common in Alaska that a small town called Haines has been hosting an Annual Eagle Festival for 19 years. Where the fish go, bald eagles will follow, so look for them near rivers during the salmon run, or cherry-picking their daily catch from a treetop vantage point near the coast. 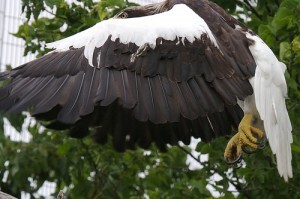 When one flies overhead, it will get your attention: the wingspan of an adult bald eagle is seven feet when spread. That means that the eagle is taller than you. Much more rare than the prolific bald eagle, seeing a Steller’s sea eagle close up is the true feather in any birdwatcher’s cap. These birds frequent Bristol Bay in the southwest and migrate to the shores of Alaska from Asia. Just how big are they? Twice the size of a bald eagle, with a wingspan of 14 feet and a hefty weight of 20 pounds. Although they have maintained legendary status due to their scarcity, you certainly won’t be needing binoculars to spot these giant birds. High up in the mountains and in the Arctic regions, the Dall sheep is king. Famed for its dramatic curved horns and charged clashes between males during the mating season, these snowy white creatures inhabit their regal statures with ease. 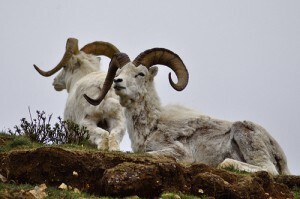 Despite the inhospitable landscapes they favor, Dall sheep often live for more than a decade, and females as old as 19 years have been discovered. Want to see just how old a Dall sheep is? Count the rings on their horns, which are comprised of keratin – that would be the same material as human fingernails. Their hooves are specially adapted to rocky, precarious terrain that looks impassable to our eyes, which makes a chance encounter with a Dall that much more rewarding. The current Muskox population of Alaska actually represents a heroic rescue effort on the part of concerned naturalists to return this native species to its former glory. Ovibos moschatus weigh between 400-800 pounds and with their long, tufted fur, Eskimos termed them “the animal with skin like a beard.” If you catch a glimpse of one, you will likely agree that they look a bit wise and woolly. 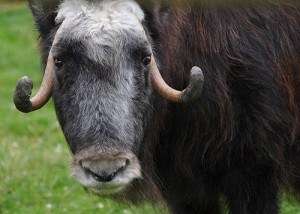 After the last ice age, muskoxen around the world began a vanishing act, and Alaska was no exception. By the 1920’s, they had disappeared from the ecosystem. However, in 1930, a small cadre transported from Greenland were reintroduced to the state and began to flourish. Their robust growth led to a rejuvenated herd of 4,000 muskoxen by the year 2000. Just call them the comeback kids. 9. The state mammal is a grumpy ambassador. 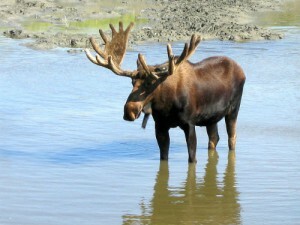 The Alaska Moose is a large subspecies of moose that can weigh over 1300 pounds. Solitary creatures that prefer their own company except to mate and raise young, they are actually more dangerous to encounter in the wild than a bear. This isn’t due to moose having a more aggressive nature, but simply the fact that they outnumber bears. Alaska moose have unpleasant encounters with humans 5 to 10 times per year, which is more than all Alaska bear attacks combined. What should you do if you meet a particularly testy representative of Alaska’s state mammal? Start here. 10. You’ve come a long way, baby. 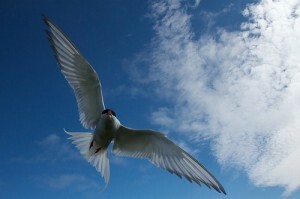 The Arctic tern is a seabird known to complete a circumpolar migration every year. A circum-what-now? This means the tern actually completes two summers – one in the icy cold clime of Antarctica, and a second in the northern reaches of the globe. That’s where Alaska comes in. Each year, the Arctic tern must fly a truly incredible 12,000 miles between its summer and winter feeding grounds. This makes it the animal with the longest migration pattern in the world. In comparison, Alaska seems pretty close now, doesn’t it?